Nothing can turn a round of golf when the temperatures are cool (or even cold!) into an enjoyable time better than the proper outerwear and Fila Golf has additions to its collection ideal for accomplishing that goal. Fila also is a proponent of layering when the temperatures fall as can be seen by the coordinated looks and pieces of the latest items. $130.00 – This is a 3-layer performance soft shell bonded with microfleece and a padded quilted lining, adjustable sleeve closure with Velcro, laser cut welded right side chest pocket with zipper, two front hip welded pockets with microfleece lining, interior left side security pocket with audio port access. $70.00 – available in February and made from Tech-Dry and anti-bacterial with zipper placket and contrasting – 86% polyester/14% spandex. $100.00 – Moisture wicking textured fleece jacket with front pockets, self adjustable sleeve closure with Velcro. Made from 100% Polyester. $110.00 – full zip heavy knit (50% cotton/50% acrylic) sweater with contrasting collar, cuffs and hem, even hem. 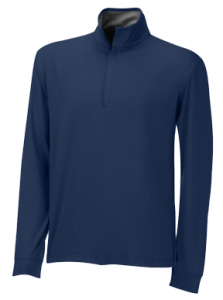 $90.00 – a 100% cotton pullover with contrasting “V” neck rib, rib armhole and rib hem band. Thanks Ed for reviewing our products on your site.